McKenzie Higham Architects was engaged to redesign the Mitsubishi Motors Wellington building frontage and client service areas to create a coherent customer-focused experience. The earlier uninspiring entrance and disjointed service areas were limiting the company’s potential to deliver efficient customer service. The building lacked a clear entrance and a lack of visibility meant that customers were unaware of the full range of services on offer. Our design introduced a red box housing a first floor meeting space to create a strong focal point for the building frontage, clearly identifying the entrance. Once inside, customers are in a bright open area with a welcoming reception desk and café waiting area. The signature red continues as a consistent colour across this and other service areas. Each separate service area now has visible signage and a clear relationship to each other. 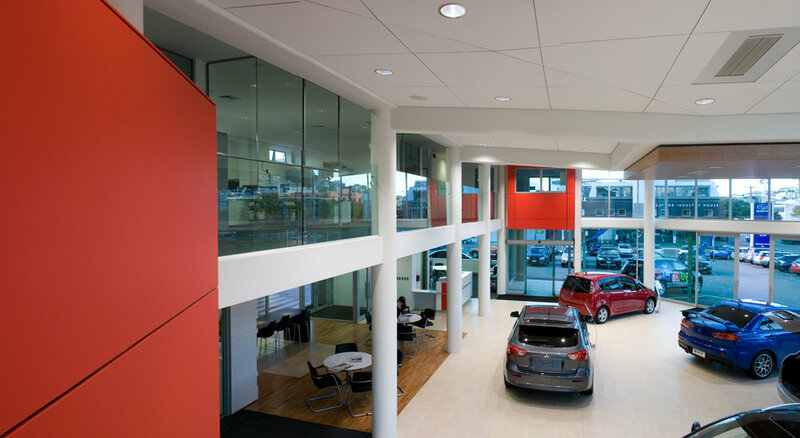 This transformational architecture now supports a whole team work environment, enabling Mitsubishi to provide the excellent customer service they aim to achieve.